Although I only got into traveler's notebooks a few months ago, I have quite the collection of supplies. I'm the type of planner who goes all in once they find a new planning style that works for them. Clips, inserts, dashboards, the works. My collection is constantly growing so I wanted to pause this moment in time to see exactly what I have. My traveler's notebook cover collection has been kept to just two since the leather options out there are just so expensive. I use an A6 size that works really well for toting around and jotting lists. Mine came from Chic Sparrow as I love their quality and bohemian feel over other options out there. I found a few PR package boxes lying around to re-purpose for my collection. Both boxes are small enough to slip into one of the openings on my desk so they're always close at hand. 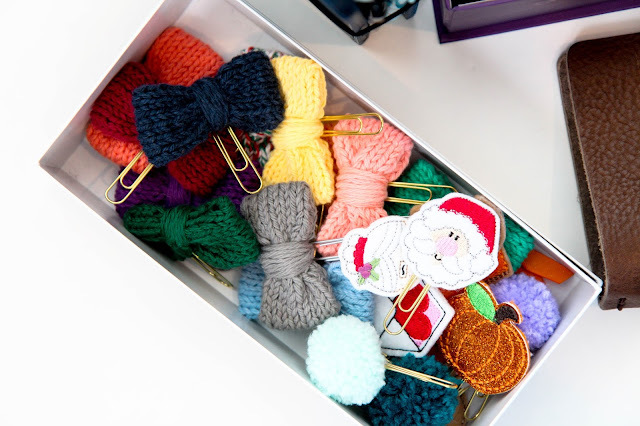 This first little box houses all of my felt paperclips from Created by Danielle and Book Nook Patch as well as my beloved Lilac Pineapple Co knitted bow clips (use code OHHELLO20 to save 20%). I'm sure there are better ways to organize clips out there so that I can see them all, but I love how low profile this box is. Plus it helps encourage me to stop buying anymore clips. 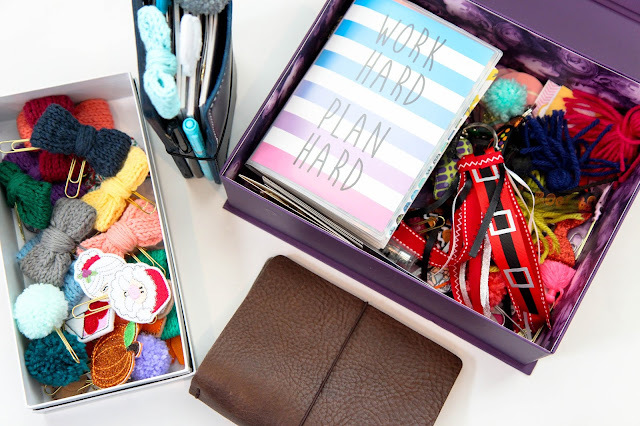 The main box is a bit of a mess of inserts, dashboards, and all the other clips and things that aren't felt or knitted. On the left is where I keep used notebooks, out of season inserts, and my sticker organizer I've re-purposed to store dashboard papers and die cuts. 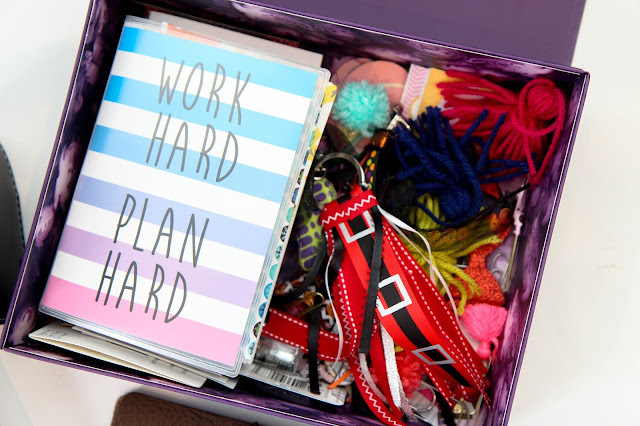 A6 traveler's notebooks are roughly 4x6 making this organizer perfect for storing anything I may need to snazz up my notebook. There are also some pens and business cards for traveler's notebook related stores tucked into the side. So there you have it. A messy yet functional way I store everything I use for my notebooks. If you want a more detailed look of anything in particular, just leave a comment!